The villa in Lipari has 4 bedrooms and has capacity for 6 people. The villa is homelike, is very luminous, and has 200 m². It is located right next to the beach. It has views to the sea and to the mountain. 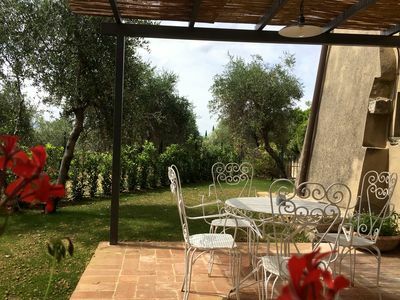 The accommodation is equipped with the following things: garden, garden furniture, fenced plot, 100 terrace square meters, iron, hair dryer, balcony, air conditioning, private swimming pool, 2 tvs, satellite. In the independent kitchen, refrigerator, microwave, oven, freezer, dishwasher, dishes/cutlery, kitchen utensils, coffee machine and toaster are provided. 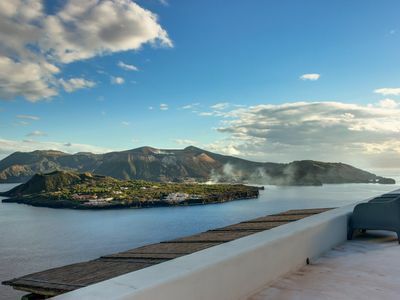 Experience the trip of a lifetime at this gorgeous Italian villa in the Aeolian Islands. With a private pool, incredible ocean views, and access to a rock beach, you'll never want to leave! Located in a private 10-acre park on Lipari, this home is surrounded by beautifully landscaped grounds and terraced gardens, offering a feeling of seclusion and privacy. The rock beach is just down a hill, about 200 steps or so. Inside, the villa is modern and artistic, with numerous places to spread out and relax. Pick up some fresh ingredients in town and start experimenting in the fully equipped kitchen, then enjoy your meal al fresco on the patio. The TV is equipped with cable, but please note that there is no internet - although you'll be so busy exploring this island paradise, you likely won't even miss it! There's room for six guests between the four bedrooms and four-and-a-half bathrooms. In two of the bedrooms, you'll find double beds and en suite baths. A third bedroom features two twin beds, and a final loft-style bedroom rounds out the sleeping options. This home is ideal for guests seeking to relax in luxury. Enjoy a few laps in the private cliffside pool and gaze upon the gorgeous Tyrrhenian Sea, or head down to the rock beach to sunbathe and splash in the waves. From the covered patio, admire the beautiful islands located just across the way. Pay a visit to the city of Lipari for a delicious Mediterranean meal in company of a chauffeur that will be at your service if a ride to town or the beach is needed and enjoy wandering through the narrow brick streets. Stop by the citadel for a tour, check out the archaeological museum, or see what's happening at the harbor. There's no wrong way to vacation at this island paradise. Start planning your trip today!